The scooter takes it's inspiration from the VLX 600 and ACE 750 which were, in turn, inspired from a cross between a chopper custom and a heavy duty cruiser, they each have a style that does not go unnoticed. Its body is mainly plastic (so, it won't rust!) which extends backwards, resembling, if anything, the back of a bee! Plastic with chrome attachments, like the wide curvy handle bars, (perfect as something to fiddle with when you get stuck in traffic, or just a boost to one's ego (they are so wide)). They may not be the most practical, but they sure do attract people's attention! This Shadow has all the comforts of a modern scooter. Models: SRX50 and SRX90. Features Include: Aerodynamic design, front disc brake, chassis made of steel tubes, alloy wheels. 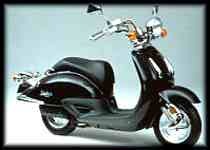 It is available with a 50cc or 90cc motor.